What does nöni™ stand for? Nothing in language, but it's short for our original full product name: Conductive Seamless Stainless No Nickel. Too much of a mouthful! What is nöni™ made from? Does it have clad layers? Our multi-century warranty applies whether used in the home, restaurant, or campfire.....nöni™ is basically indestructible! Thank you for your interest in our innovative seamless nöni™cookware! There are more differences than similarities, in everything that is important in cookware. Our patented seamless 1 piece construction is the most obvious. This world-first innovation means that we don't need to rivet on a handle: our pans are one solid monobloc, so they're indestructible (expect centuries, not decades) and hygienic. Our 3mm thick solid ferritic stainless is nickel-free and more conductive than the common austenitic stainless steels, even when they are sandwiched in a multi-ply with aluminum, copper, etc. our Windsor pan body shapes are better at cooking that needs evaporation, and our lids are not just lids: they are also high performance flat skillets in their own right. All-Clad is one of the best of the old traditional cookware styles. Nöni is a whole new era, in our humble opinion. I hope you have a chance to try the differences! How can it have a multi-century warranty? Everyone is shocked at the conductivity of our Australian AUS-ION, even the experienced chefs! Our nöni material is even more shocking, because everyone is used to the old school tri-ply or disc-base stainless pans. Our ferritic stainless is highly conductive, and solid from the heat source through to the food. We were very fortunate to find a source of this material in Germany for our Aussie nöni (no stainless is made in Australia), and exactly the same spec in the USA for our US production, using US steel. How can solid stainless steel be highly conductive? 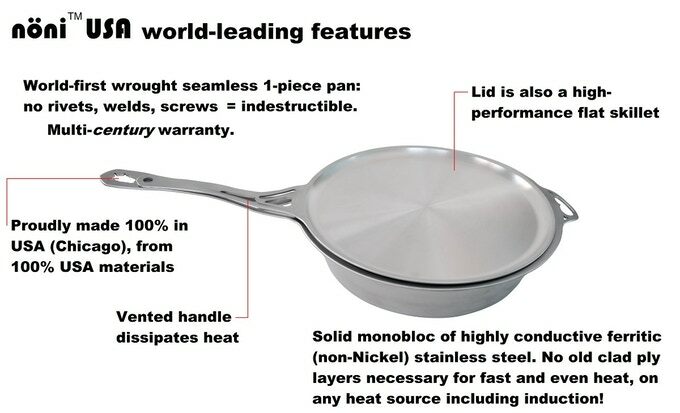 This is a whole new way to make cookware from one solid monobloc of highly conductive stainless. More conductive than all the old clad multi-ply cookware that has dominated at the top end for decades. Isn't solid stainless steel a poor heat conductor? Absolutely not, this is our exceptional conductive solid ferritic stainless steel! Our USA-made stainless is not the more common Nickel austenitic stainless steel: our ferritic grade is much more heat conductive. In fact, it is almost twice as conductive as normal austenitic stainless, so it heats faster than complex old clad multi-ply stainless steels traditionally used by all the other top brands. They also need rivets/welds/screws. Our nöni™ is one solid seamless multi-generation indestructible monobloc of tough ferritic stainless. Any thermal images of the heating vs a clad piece? The university tests are coming up, but for now we’ve got 3rd party videos under controlled conditions, and the real world feedback from chefs and experienced cooks. Some is on the Kickstarter site, and even more in reviews and the @solidteknicsusers FB group.